You can use a regular muffin tin and spray the top area of the tin before putting in the paper lined cups for the wells. 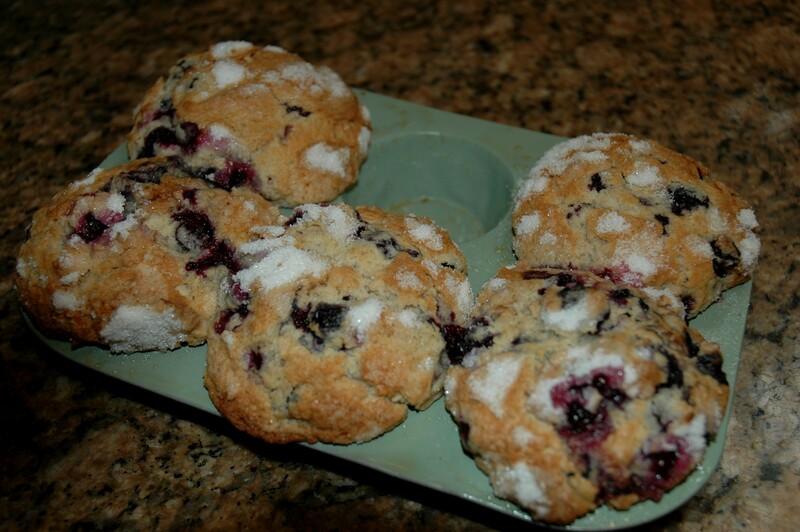 OR, use the Silpat (rubbery) muffin "tins" which I prefer. Just spray them and forget the muffin papers. Beat in eggs and cream until fluffy. Add vanilla, half and half , baking powder, salt and cinnamon, mix briefly. 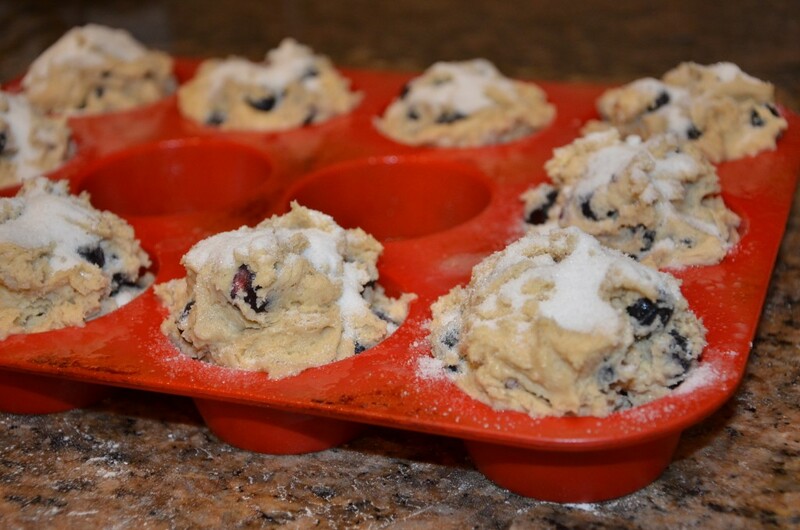 Use regular size muffin tins. Bake at 375 degrees F for 40 minutes if you are using frozen blueberries. Less if they are fresh. We pick about 100# of blueberries in the summer, so almost all of my baking is using frozen blueberries. They turn out great. I am not sure about using frozen blueberries from the store, they might be mushy. Test with a toothpick. Serve hot with butter. 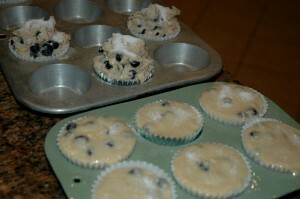 In the photo at left you can see in the top pan about how much batter I use for regular blueberry muffins. 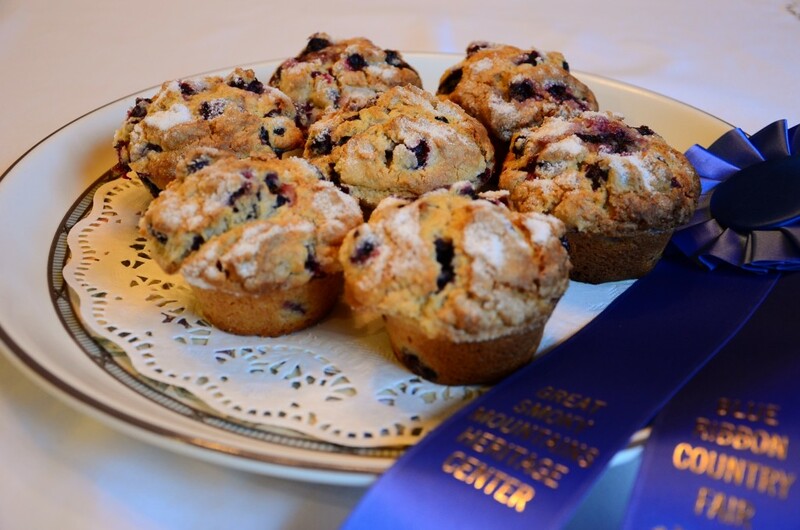 Full Batch 10 muffins, ½ batch 5, unless you want to make them slightly smaller. If you are making gluten free the batter is a lot runnier. See the photo at left, green pan. It will make 6 for a ½ batch or a dozen for a full batch. Substitute McArthur Gluten Free Multi-Purpose Flour for the regular flour. You might have to add an additional ¼ cup to thicken it up a little however that will make it a little more crumbly. Instead of putting in the extra flour you can use 1 teaspoon of Xanthan Gum per full batch. It worked beautifully. If you hadn't told me they were gluten free I wouldn't have known. You can buy Xanthan Gum, which is a binder, in the specialty food section. The white and blue box of McArthur Flour is in the regular flour section. Tip: I pick blueberries every summer and freeze them for use all year long. The trick to freezing them is to use an orchard where they don't spray any of their bushes. After picking DO NOT WASH them, furthermore, spread them out on trays and let them air dry for a day. When they are totally dry, pick out any remaining stems or leaves as you place them into plastic containers. They will last for a year or better. You can take these right out of the freezer (they will be loose, not stuck together), measure out what you need and put the rest back in the freezer. I dump them into the batter above frozen, mix them in, and put them right into the oven. The frozen fruit you buy in the store can be wet and mushy because of the preservatives and they are frozen when they are damp. I would not use store frozen blueberries in this recipe. This recipe would probably make a dozen muffins. I like mine larger and well crowned as you can see by this photo, so this recipe makes 10 for me.